Consistently ranked one of the best family beach vacations there is something for everyone of any age. Check out this fun 6-day itinerary perfect for the kids or the young at heart. No visit is complete without visiting the beach! Spend the day playing in the sand and surf. Roanoke Island Festival Park is an interactive family attraction that celebrates the first English settlement in America. Explore the Elizabeth II, a representation of one of the seven English ships from the Roanoke Voyage of 1585. Discover the American Indian Town and a 16th century Settlement Site. Peel back the layers of the past and imagine one moment in time, at one place in history. Experience Island Farm a living history site interpreting daily life on Roanoke Island in the mid-1800s. NC Aquarium On Roanoke Island. Explore the waters of the Outer Banks at the NC Aquarium. Learn about stingrays alligators, otters and so much more. Discover the conservation efforts in the Sea Turtle Assistance and Rehabilitation Center and see the largest collection of sharks in the state. The North Carolina Aquarium on Roanoke Island is a must see. Become a Junior Ranger at the Wright Brothers National Memorial. Pick up your entire Junior Ranger booklet and program schedule from either of the Wright Brothers National Park visitor centers. Complete the program and earn your Junior Ranger badge! Explore different activities carefully designed to support the development of important learning principles. 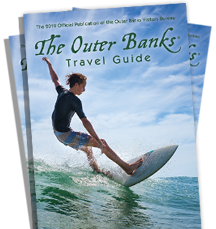 Learn about lighthouses, try balancing on a real surfboard, dancing on your own tv screen, and pretend being on an Outer Banks Fishing vessel. Take an art class. Classes are offered year round. Take home a piece of your painted pottery, sand art, or painting to remember your vacation on the Outer Banks. Take what your child learned about lighthouses at the Children at Play Museum to a real lighthouse. Explore Bodie Island Lighthouse. Climbing optional from the third Friday in April through Columbus Day (in early October). This nighttime activity is a family favorite. Once the sun goes down the real fun starts. Grab a flashlight and head to the beach. Watch the sand as the ghost crabs scurry away from your light. Please do not harm crabs. 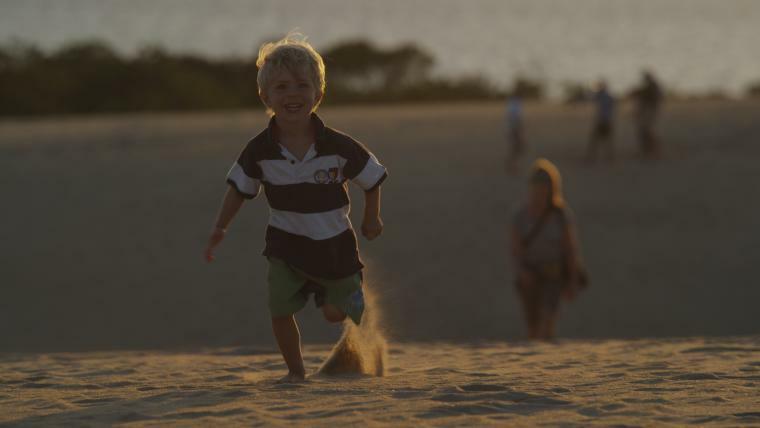 Climb to the top of the largest living sand dune on the east coast. Don’t forget a kite! Jockey’s Ridge is one of the best places on the Outer Banks to fly a kite. Try to get a hole in one at one of the Outer Banks mini-golf courses! Mini Golf courses range in themes from dinosaurs to pirates. Learn the basic skills of pier fishing from how to cast and tie rigs, best bait to use for target species, pier fishing etiquette and catch and release techniques. Discover Pea Island Wildlife refuge. The Pea Island Wildlife refuge offers sanctuary for over 350 bird species, 25 species of mammals, 24 species of reptiles and 5 species of amphibians. The visitor’s center offers programs focus on interpretations, environmental education, wildlife observation, and fishing.